I owned a Patagonia wide brimmed sun hat for many, many years. It was one of my favorite hats. They’ve stopped making it and I even forget its name, but it served me well. It was packable, super durable, stayed on my head, and if need be could literally be squished into my pocket. I sewed a patch on the inside, twice, and probably put it in the washing machine over a hundred times. This past week it finally died on me after ripping in half when I tried to wring it out after getting out of a pool. Luckily I did have another hat on hand, as I knew my old faithful was close to dying. This new hat, the Patagonia Sun Booney, is just what the doctor ordered for people who love wide-brim hats, are concerned about weight, packability, and get wet a lot. I spent the last week in Baja, Mexico chasing rooster fish up and down the beach of the east cape and my new Patagonia Canvas Sun Booney was perfect for the task. Its material is robust but very light. It dries out super quickly and has amazing protection all the way around. There are two ways to tighten the hat: a chin strap, which I typically just put on top of the brim behind my head (unless its really blowing), as well as a rear internal bungee that can be cinched down and proved to be perfect for cruising down the beach on four-wheelers. Even at high speeds the hat never came off. My daughter did however pull it off in the pool and to my surprise it floated for the entire time I left it there. 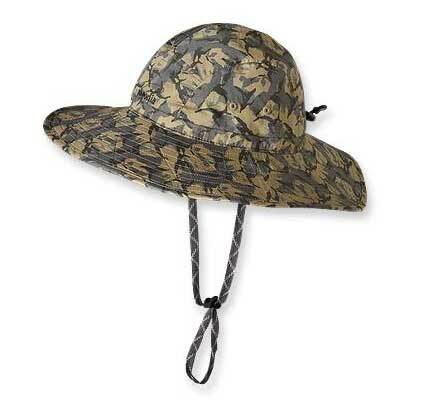 The hat comes in three colors, and much to the chagrin of my wife I picked the camo color you see here. The hat retails for $49.00.